This past weekend was the weekend for things breaking. Being responsible for fixing things when they break is one of the simple pleasures of being a homeowner (rolls eyes). The fact that maintenance seems to never stop, there’s always a project to be done. Fortunately Rob loves tinkering, fixing and maintaining. He’s a skilled handyman and looks quite handsome in his tool belt ;) . Friday afternoon the grinder pump alarm sounded as I was stepping out of the shower. I denied what I was hearing, but then quickly faced reality. I let out a long nooooooooooo! I’d heard this alarm years before when the entire pump had to be replaced. It’s a loud alarm that tells us if we don’t stop running water or flushing toilets, sewage may back up into the house. Needless to say, this was something Rob left to the professionals. It was after hours and they couldn’t make it out until the next morning. Good for us, I had this salad on hand and we settled in to watch Cooked, by Michael Pollan. I’d been wanting to see it, and had just restarted our Netflix subscription. Have you seen it? I’m not sure I agree with what Pollan says about vegetarianism or plant and domestic animal partnerships, but one thing we both agree on is how we’ve collectively lost touch with where our food comes from, and the people who grow it. Our modern society is all about convenience. But convenience comes at a cost, not only to our food system, but also to our health and the health of our planet. It’s all connected. After the first episode of Cooked, we were hooked and ready to watch the second. Then we lost audio. Attempting to fix it proved unsuccessful. We decided to call it a day. Saturday was much better. After a trip charge of $200 (weekend fees, ya know) and a quick pump repair of $125, we were back in business (ahem). Then we were off to the farmers market where the veggies and fruit are so beautifully abundant right now. Staying focused is sometimes a challenge. 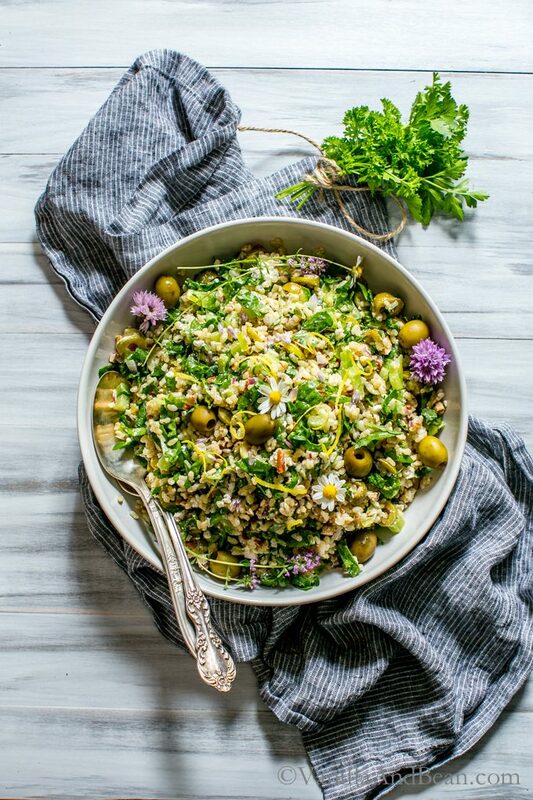 During Summer salads are a daily habit simply because the market is full of beautiful greens. I love salads that hold well in the fridge for days, so I can make it once and eat on it the rest of the week. Talk about convenient. This recipe was one of my earliest on the blog and one I make over and over again. The photography needed an update, and our CSA had a bounty of spinach. It was time. Have you found your local farmers market? If not, check out local harvest to search for the one closest to you. For a quick read on why I support local farms, here’s my top 10 reasons. The audio is fixed now, and I’m looking forward to the next episode of Cooked. I’d love to know your thoughts on Pollan’s Cooked, if you’ve seen it, in the comments below. Combine the brown rice and water in a stock pot and bring to a boil. Stir once, put the lid on and cook on low for about 30 minutes. Let rice sit uncovered for 5 minutes, stir again, then spread it out on to a parchment lined sheet pan to cool in the freezer for at least 1/2 hour. The rice can be made one day ahead and chilled overnight. Preheat oven to 350F. Toast the pecans for 13-14 minutes, or until fragrant and slightly darker. Set aside to cool. Chop into small pieces. Combine the rice, pecans, bell pepper, olives, onion, spinach, feta and parsley. Set aside. To make the dressing, squeeze the lemon juice and zest into a bowl, whisk in the olive oil, salt and pepper. Pour the dressing over the salad and toss well. For best flavor, chill for at least 1/2 an hour then serve. Store in a lidded container in the refrigerator for up to three days. Do you Love Meal Prep Ready Salads? Me Too! Find more like this one and the ones seen below here! Beautiful collection of salads (made me hungry)! They’re all perfect for summer! Congratulations on the release of your book – can’t wait for my copy to arrive! I make this regularly. I’m not a fan of olives…I added about a cup of golden raisins and dried cranberries. I also used Myer lemon oil for that extra kick and about 1/4 c of organic honey. Soooooo yummy! Hi Ann! Thank you for your note. So happy you’re enjoying the recipe. Queso fresco sounds fabulous! So happy to hear this, Jen! This salad is one of my favorites on the blog… I make it frequently! Thank you for your note! Extra Virgin Olive Oil is always the best option to dress the salads because of its healthy properties and its excellent flavor. We suggest arbequina olive oil for salads. Any chance you can fix the formatting in the recipe? The html code seems to have invaded. Can’t wait to try this recipe Traci! Looks fabulous! Saw this one from Instagram and it looks amazing! Really love how the salad uses brown rice! Can’t wait to try it out! Thank you Jess, for coming by! I hope you love it! Comes with the territory.. homeownership! :0 ! LOL on the BBQ.. well, you wouldn’t like watching that part either! I love a salad that can sit in the fridge for a few days, too…perfect for a work lunch or just lazy days :) Looks absolutely delicious, Traci! Hellooo my friend! I took a little hiatus from blogging, but it’s so good to be back and catch up on all your gorgeous recipes! 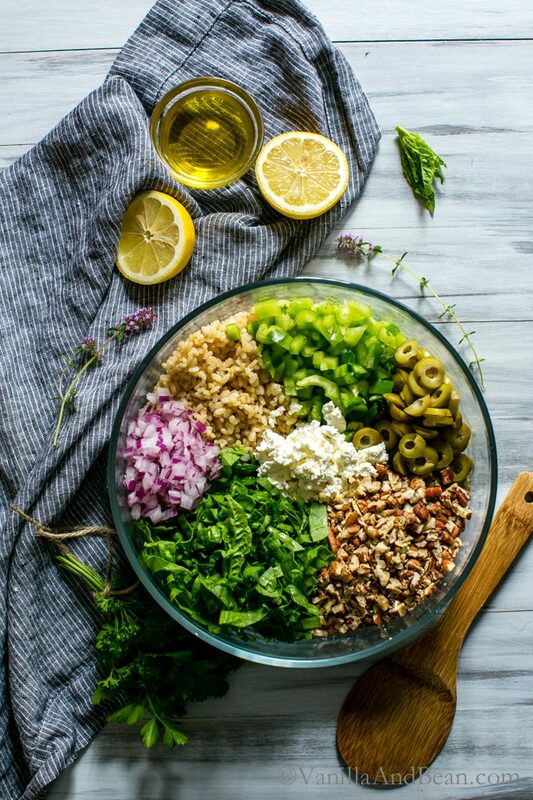 This salad is definitely up my alley – the salty olives and feta, the beautiful green spinach, the nutty rice and sweet pecans…you’ve done it again! I am not a homeowner yet, but my friends and family always tell me that fixing fun things like pipes is one of the best parts ;) Hopefully your woes have come to an end and you can relax! I saw the first episode of Cooked but haven’t watched another yet. The first episode was definitely not as pleasant to watch as a vegetarian, but I completely agree that his point about getting closer to food is so important. Hopefully as a society we can rekindle our traditions of cooking and sharing meals together. We haven’t watched Cooked yet but I’m always looking for more things I can add to my Netflix list. :) I’m glad you have enjoyed it so far – makes me excited to watch! LOL – a swig of vodka, actually with all that cherry limeade syrup I had! I threw some in the freezer too! LOL! Hi Traci, I only want to check if I found a RICE SALAD recipe on your page because I deciced to cook something with Rice this evening. And look at this?! The first recipe I see is a Rice salad. How CRAZY IS THAT??? Too funny. It’s amazing how salads have evolved, they used to be just a side dish or what you had before the main course, now they are the main course. I am so happy about it because I love big bold salads. This is a big and beautiful one. I couldn’t agree more, Celeste! 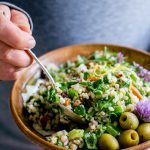 Salads have come a long way as has the variety of grains to enjoy with them. I absolutely love big salads during Summer.. when it’s just too hot to do anything near a stove! What a pain! We seem to be unlucky when it comes to things breaking as well – within 1 month of each other our stove stopped working (twice!) and our fridge randomly lost power and we had to throw out all our food. Not fun! This salad looks like the perfect fresh dinner side! I love the flavour punch that feta adds to a meal. Oh NO! Chelsea, did you get your oven working? And all that food? How awful and such a waste indeed. I love this recipe you shared. It is such a down to earth type of meal. No frills, no fuss. Just simple and filling it seems to be. I know you share vegetarian and vegan recipes but I am curious to try this as a stuffing for roast chicken. I discovered stuffing chicken with a rice mixture a few years back and quiet honestly find it a lighter option than bread crumbs. Any who. About the documentary Cooked. I really enjoyed it. I loved how in the world we live in today, the food culture of home cooked and back to basic is really stepping up with the entire farm to table movement but I think many things are still lost as this “fad” some may call it is plastered all over social media and restaurant adds. What I really enjoyed was how he seemed to break down basics of bread making, fermentation, and simply cooking to bring an honest connection between humans and what we use as food. I too started updating old recipes and have been enjoying the love that I get from my friends and readers. I love how easy to make and refreshing this salad is Traci. And the photos.. breathtaking! PS: We binge watched Cooked in two days back in winter of this year. I love Michael Pollen and his storytelling. Very informative and eye opening, indeed. Thaaank you Aysegul! It’s a good time to reshoot and rewrite where needed! No doubt Pollen’s work is important and timely. But what he articulates is how I feel.. so much so! We watched Water this weekend! Can’t wait for Air. Sooo good. I reflex smile when I see vanilla and bean pop up in my email. 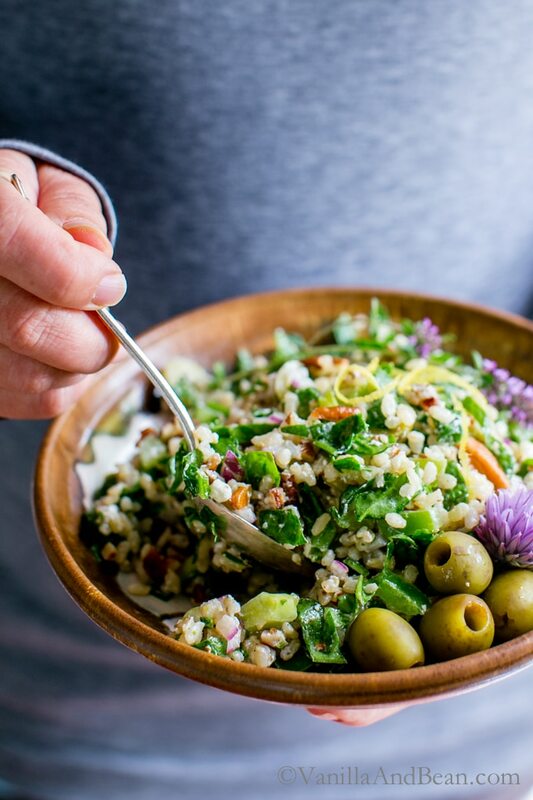 I always like the recipes I try and I’ll definitely make this brown rice salad. What I enjoy most about your lovely place here is how natural and fresh it is. I appreciate your work – obviously labors of love. Thank you so much for your kind comments, Gloria. It means so much to hear from you! I hope you enjoy the recipe! Thank you Rachel! Those little flowers are so pretty and from various herb pots around our home. They make a salad look all fancy! :D I hope you enjoy this Rachel! Hi Traci. Recently discovered VanillaandBean. Great sight! Been perusing the recipes. Great ideas for a guy and his family going more vegetarian. Been severe Celiac for years. Have GF blog and have GF baking book in the works. Love so many of your ideas and combos, lending themselves to allowing me to de-glutenize them (my favorite made up Celiac word). Found your sight by searching for Sweet Potato Veggie Burger. Wanted something with lentils, too. Your recipe hit that and more! We eat lots of quinoa, and I have added it to my veggie burgers, patties, etc. But your recipe really hit the trifecta with the addition of Kale! With so much growing in my garden, I put it in everything…almost… ; ) But your Sweet Potato Lentil Quinoa Kale Burger was wonderful!! 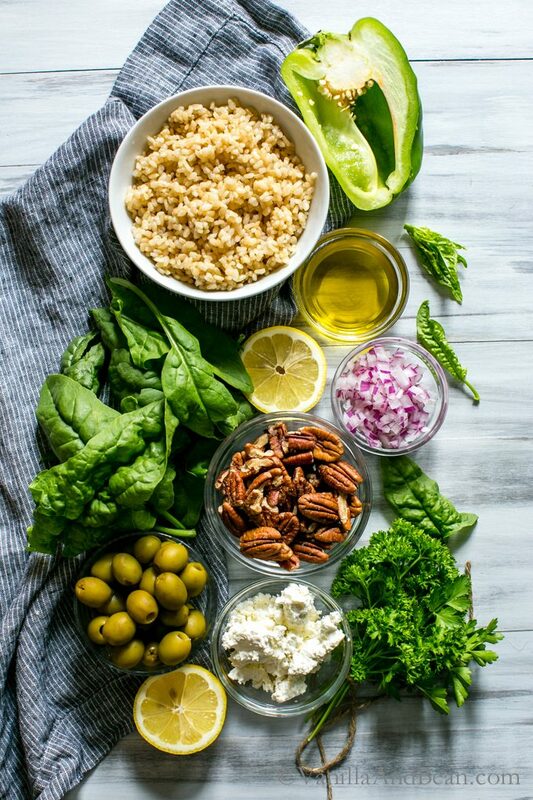 Now this simple Brown Rice Spinach Pecan Salad looks so good, healthy, and easy. I tend to take liberties with most on-line recipes…but I think this one will be tried as you suggested. Thanks for such a wonderful sight! Thanks also for including GF options…there are SO many of us out there who appreciate that consideration!!. Hey Scott! Welcome and thank you for your kind comments! It’s so good to hear from you. That veggie burger, yeah, I get it. I’d love it if you could leave a comment on that recipe perhaps sharing how you made it GF? So happy you love it. That continues to be a favorite here.. in fact, It’s time to make it again.. I’ve missed it. I’m so happy you’re enjoying the blog. Congratulations on your shift to vegetarian eating, starting your own blog and writing a book!! I love seeing the bowl in your beautiful hands, Traci! Fills my heart! I hate when things go wrong at the house too Traci! This week was our week with problems with the cars! Ugh! Both my car and the extra one Casey drives had to go into the shop!! Bills, bills, bills! Oh well! What a gorgeous salad this is. The colors and the list of ingredients have me drooling.I love the simple, light lemon dressing too. Perfect for summer my friend! Can’t wait to give this one a try! Have a wonderful weekend and thanks for sharing! I’ve not seen Cooked, but Lucas and I were just talking about how we need something new on Netflix to get addicted to! I’ll add it to the list. I”m so glad you didn’t end up with poop in the house (I just said poop on your blog!) and everything’s in working order again! This salad is gorgeous and I love how each bite has so many different flavors. It’s no wonder you make it over and over again! I could eat a whole giant bowl of this, Traci! Just so good – and I remember thinking the same thing the first time you posted it :) – love the new photos! As for plumbing disasters – they can become really alarming really fast. I just had a pipe burst inside the walls of my house – thank goodness I was home – it would have been a really disaster if I had been at work! Geraldine… Thank you for coming back.. I think you were one of my first commenters/followers! Thank you for your support. I’m sending you a virtual hug! OMGeee a busted pipe in the wall!? Whaaat? Awful, indeed! I’m so glad you were home. What a relief! So many flowers coming up all around the house.. lots of chamomile and thyme.. it’s so pretty! Thank you Medha! Just made this and it was amazing. I’m so bored with lettuce salads and found it so tasty and easy to make. Even my meat loving husband keep sneaking into the fridge w a spoon. Made him a contain of his own. it, Thank you so much for sharing it. Hi Traci! This salad looks yummy! Cannot wait to try it out! Sad to hear about Claire, it is truly hard to lose a long time family pet that is close to your heart.